CCA500 (Multiple Choice) Exam has been retired by Cloudera. It has been replaced by their CCA131 : CCA Administrator Exam . 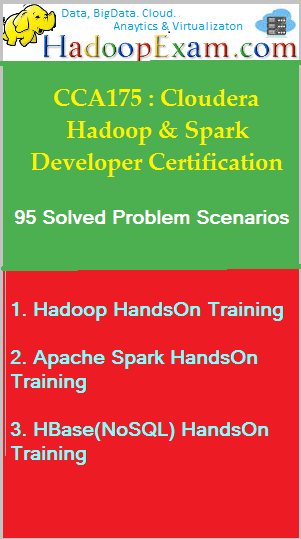 HadoopExam is in process of creating material for this certification exam and will be launched around 15th of August. Hence, please subscribe here to get the Alert for this material release. However, CCA500 material will always be available to buy in case you want to learn or test your skills. Just Reading the Book and online material is not enough to clear Hadoop Administrator Certification. 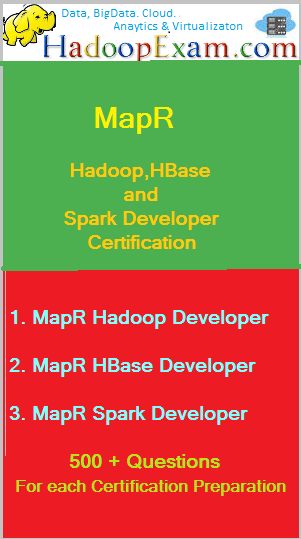 At some point you are going to have to ask yourself: "Am I ready to take the Hadoop Certification Exam?" Here is the secret to answering this question and passing the exam on your first try: Practice - practice - practice! The Hadoop Exam Simulator offers you the opportunity to take 4 sample Hadoop Exams before heading out for the real thing. Be ready to succeed on exam day! Get updates : Before appearing in real exam, please drop an email to us. If there is any update with us for example new questions, syllabus change, new question bank released , new tips or trics. etc. We will share with you. 1. Almost all questions are covered from Hadoop Admin actual exam question pools (Similar or Same Questions). 2. Our expert regularly update the questions as per the real exam. 3. All Practice Questions are included. 5. Record of 100% success ratio. 7. Best revision notes (You will nowhere find it), revise whole syllabus in just 2 Hrs. Note: If having trouble while credit card payment then please create PayPal account and then pay. Learn to apply effective "test taking strategies"
200 highly realistic CCA500 and CCA505 exam questions. Notes: Hadoop ecosystem items are no longer treated separately as their own section and are integrated throughout the exam. Both CCA–500 and CCA–505 share the same proportion of items per section. •Describe the normal operation of an Apache Hadoop cluster, both in data storage and in data processing. •Identify current features of computing systems that motivate a system like Apache Hadoop. •Determine which files you must change and how in order to migrate a cluster from MapReduce version 1 (MRv1) to MapReduce version 2 (MRv2) running on YARN. •Principal points to consider in choosing the hardware and operating systems to host an Apache Hadoop cluster. Yeah the material is helpful to test our knowledge. I passed the exam. "I wish I had bought your exam prep during my first attempt. More than anything else your tests made me feel confident to crack the CCD-410 exam. It would not have been possible without you. My best wishes to your team"